Welcome to ZAMP Plays! 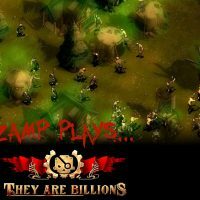 On the first official ZAMP Plays, Lou and Ryan chat about the new early access title They Are Billions. A strategy game in a distant future about building and managing human colonies after a zombie apocalypse destroyed almost all of human kind. This audio podcast is only half the fun though! Don’t forget to check out the video version where Ryan walks Lou through the early stages of a They Are Billions game.